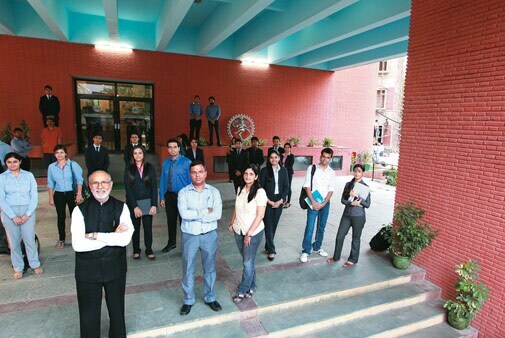 The 2014 edition of Business Today's survey of India's top B-Schools, in partnership with MDRA, reveals campus dynamics. Hiring activity is the first giveaway of economic sentiment, and it has surged, unequivocally. The Manpower Employment Outlook Survey of 5,287 employers across India says that they expect vigorous hiring from October to December. This is certainly reassuring for those gearing up for the Common Entrance Test (CAT). It is also one reason why Business Today's ranking of India's Best B-Schools, in association with MDRA, is slotted for this time of the year. This year, the BT-MDRA survey has ploughed deep by adding a critical sub-parameter of governance to present the data on 247 B-schools. It helped us find the availability of members of governing board, academic advisory board and also ascertain if the members have interacted among themselves in the last one year. It also helped us throw light on the commission and omission in the course curriculum and teaching methodology in the last one year. 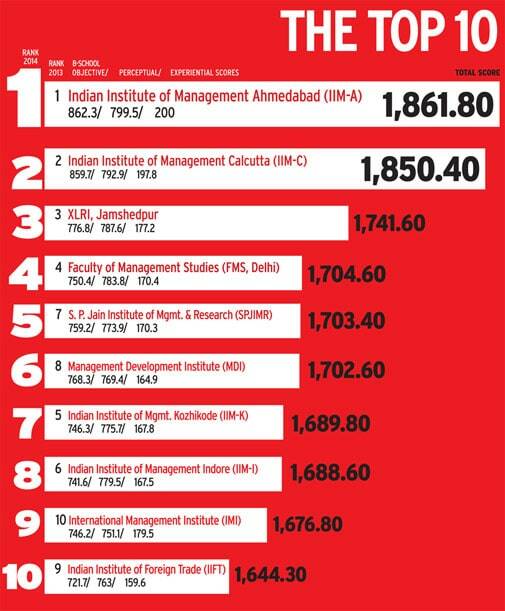 The pecking order of the top 10 B-schools remains largely intact with IIM Ahmedabad at the pole position. The institute has also put behind Indian School of Business (ISB) in our perception ranking survey that ranks the one-year Executive MBA programmes. Mumbai's S.P. Jain Institute of Management and Research (SPJMIR) gets into the top-five list for the first time. 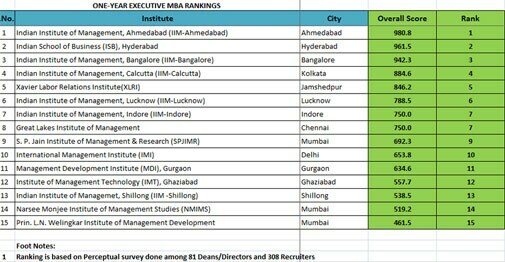 Just in case you are wondering why some reputed schools are missing from the list, this time too institutes such as IIM Bangalore and Lucknow stayed away from the survey. Others that did not share their details include the Department of Management Studies of IIT Madras, IMT Ghaziabad and FORE School of Management. Apart from the toppers's list, there is a lot to be read in the sub-text and parameters of the survey. For instance, when it comes to future orientation and learning, it is IIM-C and not IIM-A that is the numero uno and SPJMIR climbs further up the ladder here. 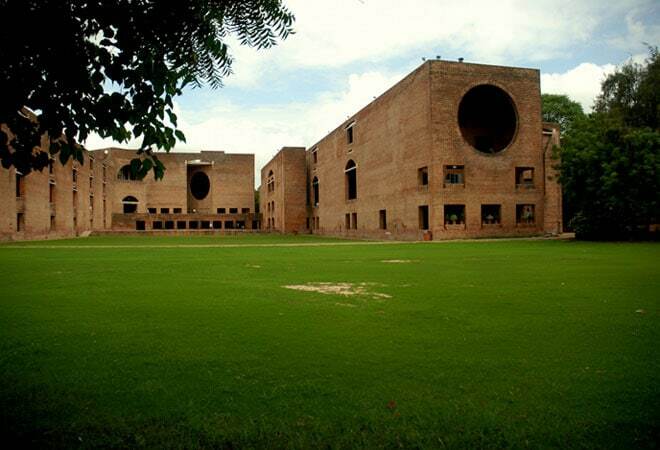 IIM Indore and IMI rank high, right after IIM-A on the learning parameter. Prin. L.N. Welingkar Institute of Management & Research, Mumbai, ranks ninth. Since bulk of the MBA aspirants join B-schools that rank between 20 and 100, BT has mined out a few surprising aspects of these institutions through campus profiles. The report on better placements on campuses is case for cheer among students. Nearly four lakh students step into the job market out of the over 4,000 B-schools every year in India. The top 25 schools alone churn out up to 8,000 students every year. For hiring that ended in March 2013, IIM-A witnessed a rise of over 28 per cent in international job offers and 10 per cent in domestic offers. The sentiment was less upbeat earlier in the year on some campuses where hiring concluded early. "Early this year saw some apprehension as mood in Corporate India was not so great. Compensation remained flat this year; there was no big jump," says Rishikesha T. Krishnan, Director, IIM Indore. Top recruiters were companies such as Deloitte, Boston Consulting Group, Cognizant, Wipro, ICICI Bank and Reliance Industries. E-commerce players too visited the B-school campuses with Amazon and Flipkart leading the pack. Flipkart hired close to 50 graduates from the IIMs and other top B-schools in 2014 as it plans to double its headcount to 25,000 by the middle of 2015. "Hiring sentiment in B-schools has been better and more companies are expected to make offers as recruitment is picking up again. We expect salaries to go up by 8-10 per cent in the FMCG sector," says Sumit Mitra, Head, Group HR and Corporate Services, Godrej Industries and Associate Companies. However, better job offers still do not justify more IIMs, as has been announced in the Union Budget 2014/15. The six new IIMs of the total 13 are still struggling to take off. Even IIM-A has to deal with a unique set of issues. 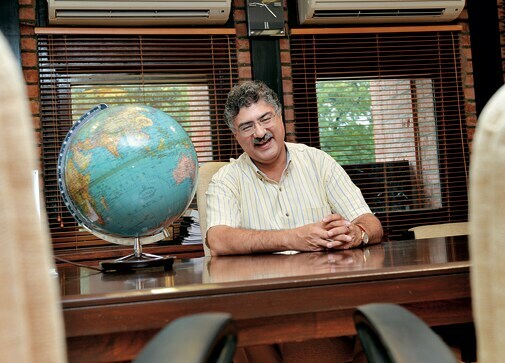 Ashish Nanda, who took charge as its director late last year, says change takes time. "A preformed template won't work and over the past few months my efforts have been to understand and learn from my colleagues. It has led to a three-pronged strategy: nurture, connect and grow," he says. One of the challenges facing the IIMs is their inability to offer competitive salaries to faculty. "When I was a student of IIM-A, we had 400 students and 85 faculty members. Today, we have 1,000 students and 91 faculty members. So it's not grown commensurate with students," rues Nanda. He says that the compensation level for Indian faculty is very low. "We need to top up the base compensation to attract and retain the best faculty. If we want world-class institutes, we have to offer the faculty world-class employment opportunities," he says. However, there is a lot of room for more premier management institutes as the country will need 250 million skilled people in the next decade. Industry estimates show that approximately 142 million students would need higher education by 2030. Present day education institutions need to increase their intake by 40 million to serve at least 50 per cent of the demand. Not all will opt for B-schools. But many need adequate skills as currently only a fifth of the students who graduate from various institutions are actually employable. This need, at the business education level, is now being addressed through distance learning programmes and newer management skilling institutes such as Bridge School of Management and Sunstone Business School that are pitching themselves as 'un-MBA'. Management schools, meanwhile, have shaped up their curriculum to suit the new industry trends. And young managers too are scaling up their skills, not necessarily by cramming theories or through sabbaticals. They also have no desire to flash their college certificates. "I think such institutes capture the sweet spot in the job market. Even established institutes such as ISB are responding to the need," says Sandeep Kohli, National Director, HR, EY. Kohli is referring to the ISB's general management curriculum crafted as EY programme. It is a 22-month course wherein working professionals need to be on campus only for a week in every quarter. The regular MBA for executives requires a full-year study on campus. Meanwhile, many youngsters are looking at alternatives. Kriti Bansal, a 21-year-old graduate from Sriram College of Commerce, has in fact put off her plan for an MBA to gain work experience, after she got a job offer from consulting firm McKinsey. "I will consider options after two or three years and would like to pursue an MBA from one of the Ivy League institutes in the US," she says. Tier-I colleges across metros have emerged as talent hubs as students manage to get job offers up to Rs 14 lakh a year. This is as good as what some of the B-school graduates get. Besides, recruiters too are seeking well-rounded talent. This is one reason MBA aspirants must calculate their return on investment before taking a call. The article Who Needs An MBA, Anyway? shows how the careers of an MBA graduate and a non-MBA student stack up. Since 2012, Godrej has an initiative called Live Out Ur Dream or LOUD. It seeks to identify passionate and creative individuals to be a part of Godrej's future talent pool. "We want students who strongly believe in something and have interest outside the ambit of cracking modules for better grades," says Mitra of Godrej. Thanks to this, Abhishek Iyer from SIBM Pune won Rs 1.5 lakh as prize money last year. "I am passionate about football and my dream was to have my own show. I was able to execute it with the money," says Iyer, 23. Now, 'Football Focus with Abhishek' is available on YouTube. EY too has scholarships aimed at discovering future leaders and it is seeking diversity in identifying deserving young women in humanities stream. "All this is important to build your brand on campuses as students are not fixating too hard only on salaries, but seek a learning environment," says Kohli. Many B-schools are also finding it necessary to apply their own management and marketing lessons on themselves. Since 2012 when XLRI started its brand-building exercise, the batch size of its two-year management programme has gone up from 120 to 180 students last year. Similarly, the HR management batch strength has increased to 180 from this year. The education sector is also witnessing the rise of institutions like Shiv Nadar University and the recently launched Ashoka University, which is offering humanities and a range of electives as a challenger to the value offered by MBAs. Students such as Bansal are keeping their options open to study outside also because of the exposure and diversity. "Here classes have an overwhelming tilt towards engineers and many just aim for good grades and placement deals," says Jatin Bhandari, Founder, Pythagurus, a start-up that offers solutions to those seeking education abroad. This is not the case about campuses abroad, where many actually do not reveal grades to recruiters as their focus is on getting students to strive harder. According to Bhandari, students in India often opt for electives that are easy to crack rather than those that will hone their skills but are difficult to score on. "Campuses outside stress on diversity and launch complex algorithms to ensure that each section has a mix of student profiles," he says. That is also why many B-schools here are rushing with open arms for tie-ups with well-known campuses. The workforce diversity is also set to increase with many people from the armed forces joining the corporate world. Also many bureaucrats are signing up for an MBA and quitting the civil services. Finally, campuses are about lasting memories of fun, bonhomie, building future banks of network and even campus romance that have led to life-long partnership of a different kind. * An earlier version of the story had misspelt 'Luis Kahn Plaza' in the lead image's caption. It has now been corrected.